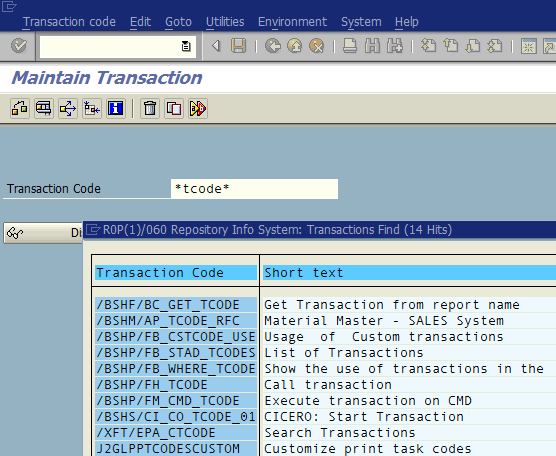 SAP users and ABAP developers can search and find a SAP transaction code using SE93 or SEARCH_SAP_MENU transaction codes. Either se93 or search_sap_menu transactions provide a way for SAP users and ABAP developers to search for a transaction code even they do not know the full name of the transaction. Even I know that there is a specific transaction for a required task, sometimes I can not remember the full tcode in the correct form. That is even worse when you are looking for a transaction that can handle a specific task where you do not know even such a transaction exists. In such cases SE93 transaction or search_sap_menu transaction will help you a lot. I strongly suggest you to add these transactions in a favorite folder on your personal SAP menu. Type SE93 and press enter. Maintain SAP transaction screen will be displayed as seen in below screen. If you know the transaction code partially type it in the Transaction Code textbox using "*" and press F4 search help key. 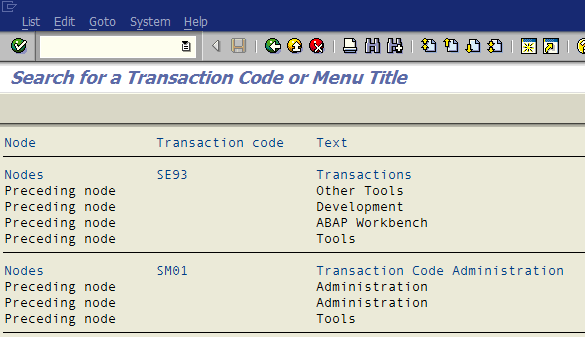 A list of SAP transactions will be listed and you can use one of the suitable transaction codes listed on the screen. Of course, if the list does not contain the transaction you need, then you can use the second method using the SEARCH_SAP_MENU tcode for a more detailed transaction search. Type the SAP transaction search_sap_menu and press enter. Type a string without "*" and press Enter. A long list will be displayed on the screen as seen in below screen shot. This screen displays more detailed information like transaction code and descriptive text of the tcode, etc. I believe if you are looking for a specific topic, search_sap_menu tcode will be more helpful to find subject related transaction codes for ABAP developer and SAP users. You can make additional searches on the screen using classic search functions of the SAP menu.